In a landmark development for the Fair Food Program, Ahold USA and the CIW announced today that Ahold has agreed to join the award-winning social responsibility program, bringing worker-certified Fair Food tomatoes to over 50 million new customers a month in nearly 780 new stores in 14 states. Here below is an excerpt from the press release announcing today’s news. You can find the release in its entirety here. 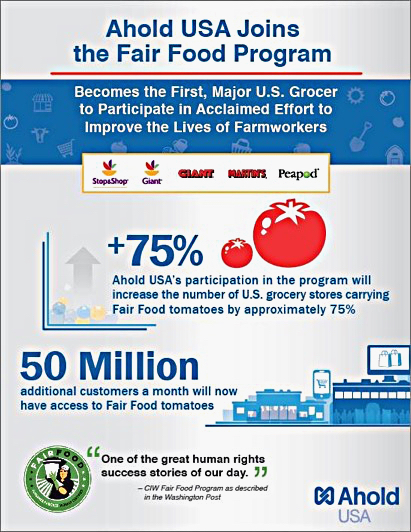 Immokalee, FL, July 29, 2015 – Ahold USA today became the first of America’s major grocers to join the Coalition of Immokalee Workers’ (CIW) Fair Food Program, the widely-acclaimed partnership to improve the lives of the country’s farmworkers. Ahold USA is the parent company of Stop & Shop, Giant Foods of Landover, Giant Foods of Carlisle, Martin’s and online grocer Peapod. With nearly 780 supermarkets across 14 states and the District of Columbia and 50 million customers each month, Ahold USA companies together represent one of the largest food retailing groups in the country. The CIW was awarded a Presidential Medal earlier this year for its groundbreaking work in social responsibility, and its Fair Food Program – called “one of the great human rights success stories of our day” in the Washington Post – protects the rights of tens of thousands of workers on farms across the east coast, from Florida to New Jersey. Today’s announcement builds on the work that the CIW as well as Ahold USA and its suppliers have done to deliver responsibly sourced tomatoes to customers and to help improve conditions for farmworkers in Florida. Ninety percent of tomatoes produced in the United States from November toMay are grown in the state. Ahold USA’s support for the Fair Food Program will extend the retailer’s long track record on responsible product sourcing and strengthen the reach, impact and visibility of the CIW’s social responsibility efforts. 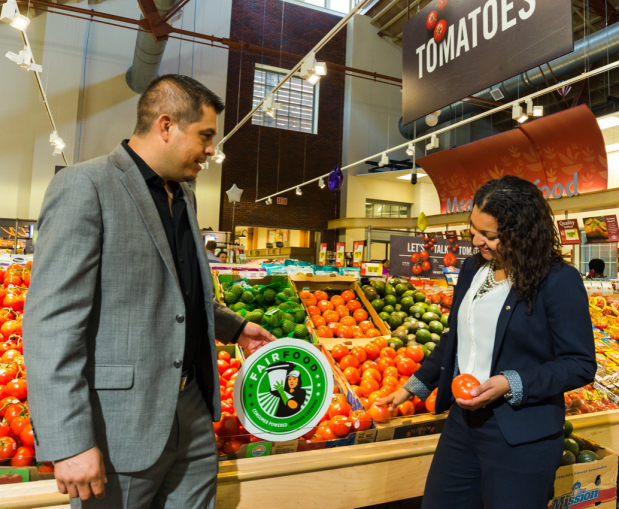 Ahold USA’s participation in the program will increase the number of U.S. grocery stores carrying Fair Food tomatoes by approximately 75 percent. Support the Fair Food Program with expanded marketing and advertising, including in-store displays, online visibility and education materials for associates at Ahold USA companies.